Anyone can buy a pumpkin at the store, but the best pumpkin picking experience comes from finding the perfect one at the farm. Pumpkin picking is a big deal in Georgia, giving folks a great opportunity to enjoy cooler weather and get in the Halloween spirit. You’ll find your perfect pumpkin at one of these 10 best places for pumpkin picking in Georgia. The name itself has a lot going for it as far as Halloween season, but you’ll want to come here to find your pumpkins for an epic experience. The farm was part of the filming of spooky cult classic “Stranger Things” and you can take a tour of filming locations at night. They also offer tractor rides and a corn maze, so plan to spend some time here. This family farm has everything going for it when it comes to fall activities, and you’ll want to experience them all. Aside from a standout pumpkin patch, you can also enjoy a massive corn maze, “haunted” activities, a search for Bigfoot, ziplines, farm games, petting barn, and the ever-popular Candy Cannon, among tons of other attractions. They’ve truly packed a lot into a single experience so you can spend the whole day here. This beautiful family farm grows all their own pumpkins on-site so you get the true pumpkin picking experience. They’re known for having some of the biggest pumpkins in the state, and grabbing a few here will certainly help you win Halloween. Bonus points that the farm is located in an area bursting with fall foliage in October, so you can enjoy the best views of fall when you visit. The zoo might be the last place you’d expect to find a premium pumpkin picking experience, but here it should be one of your first go-to’s. They’ve crafted an entire lineup of fall activities for all ages, including a scarecrow trail and hayrides. Your zoo admission also grants you access to explore the zoo and see the animals, too. One of the largest farms in Northeast Georgia, Jaemor Farms is an all-day experience during the fall. From corn mazes to tractor rides, there’s plenty to do for kids and adults alike. Their pumpkin patch spans nearly 130 acres, so there’s no way you’re walking out empty handed! Grab one that’s been pre-picked, or head to the field and choose one straight from the vine. This enchanting farm is bursting with fall family fun. Start your journey walking through the pumpkin patch and choosing the very best pumpkin for your needs. Then enjoy a hayride through the farm, fish feedings, or the abundance of fall harvest available for taking home with you. The farm itself is a scenic masterpiece and you’ll want to soak up every minute you spend here. There’s a lot more here than just a pumpkin patch, but that’s reason enough to pay them a visit. Join them for camel rides, a corn maze, inflatables, and a petting zoo, among other fun favorites. They also have a variety of exotic animals on site for you to visit. Truly a gem in this southern state, you can expect nothing short of old-fashioned hospitality here. Their sprawling pumpkin patch pairs well with a four-acre corn maze and over 20 other activities. Whether you want a pumpkin for cooking or for carving, they’ve got tons of options. Start with the corn maze, then make your way to the pumpkin patch to source your perfect gourd for painting, cooking, or decorating. The farm offers activities both day and evening, so you can take your pick of perfect time to visit. You can also stock up on fall favorites in the gift shop, like local honey, jams, and local beef jerky. Pumpkins, pumpkins everywhere! 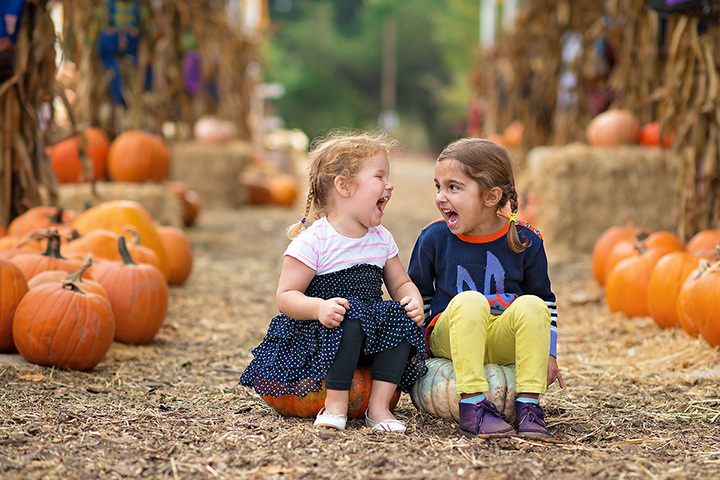 This charming little pumpkin patch features hayrides, a corn maze, and even a pumpkin-shaped bouncy castle for kids. They pride themselves on locally grown produce, as well as beautiful sunflowers that are bigger than your head!